The XV20i AC unit is one of the industry's most efficient variable speed air conditioners; on the hottest of days it cools your home with precision, keeping you cool and comfortable throughout the day. The Trane TruComfort systems give you precise comfort by running at the exact speed needed to keep your home comfortable. This allows the compressor, outdoor fan, and indoor fan to vary operating speed and BTU as the temperature outside changes, slowing down or speeding up gradually in as little as 1/10 of 1% increments to keep comfort within 1/2 degree of the thermostat setting. The XV20i air conditioner is one of the industry's most efficient systems, with ratings up to 21 SEER. 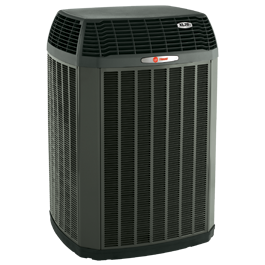 With Trane TruComfort technology, the 21-SEER air conditioner automatically adjusts itself while maintaining constant and consistent speeds to avoid temperature swings. ComfortLink II communicating technology (available when matched with communicating indoor units) connects all of your key components so your system automatically configures and calibrates for optimal performance and efficiency through the lifetime of your products. Durable, Quiet, and Economical Rigorously tortured and tested for long-lasting durability, you can be sure this system will hold up to anything, without holding up your bank account. And with the quiet running fan, 4 dB below our competitor's minimum, you can be sure you are getting a quiet air conditioner and the best all-around system for your home. Add Trane CleanEffects to your system to filter the incoming air to eliminate dust, pollen, and other irritants for a cleaner, healthier, and more comfortable home.